Swap Veers and Thrawn for DK and GK (cleanse, back-up crit immunity, squad retaliation) and u have a top 10 team. It's already a top ten team and I try not to use GK, Rex, Nihilus, or Chaze. They're just so boring and over used. Could u please post the link of your .gg profile? You modded Gar for offense. His AoE seems to have a good potential, double damage to enemies with less than 50% Turn Meter. So up to 19k on a non-crit with you mods. How are his AoE damages? Dk? Give me a break. Remove thrawn?!?? He is one of the best characters in the game. I'm glad he didn't listen to your suggestions. Have you tried zfost in place of veers? Just bcuz Thrawn is 1 of the best toons in the game atm, doesn't mean he's best for this comp. Yes DK. I suppose u think Veers adds more 2 the 2 other troopers than DK would do for DT ? What r u new ? Or just a meta fanboi ? The extra crit damage and tm that DK would feed DT far exceeds what Veers can do and his damage and debuffs r superior by far. GK giving the whole squad retribution and a group cleanse will shut the opponent down far faster than Thrawn under a Gar lead. But hey, what do I know. Only place 1st daily on a launch shard and have NEVER been meta. And then u suggest FOST ? U must b joking. U r in no place to criticize. If u can't add something intelligent to the conversation or see past "O lemme use the most powerful meta toons, they gotta b better", then u really shouldn't b posting at all. @BoxandthefuzzForever why did you mod Gar with offense instead of CD/CC? Is it because the resulting CC is too low? I have. It's good too. I have a few vids showcasing it. I used offense because with all the Rex leads out there he feeds them way to much tm. I'd prefer if he didn't crit. There are many paths to enlightenment, brother. Veers and Thrawn can be a very effective combo. I also recently pulled DN and GK from my lineup because I’m just sick of seeing them everywhere. That's the go to comp I've been running lately. It's great. Possibly one of the best pure faction teams around right now. Here is why those suggestions were not an upgrade. Veers is the only real flex spot. This means that was the dk swap. So then gk is subbing out for thrawn? 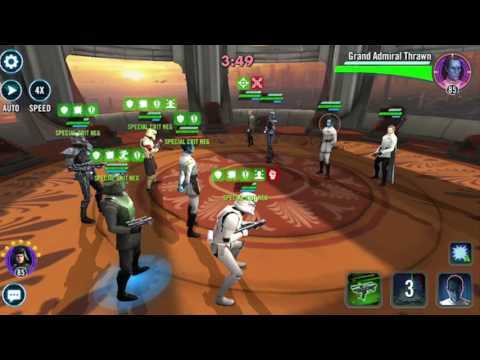 Veers brings an aoe silence, assist for his troopers and his basic brings speed up to troopers. This means that shore will almost always have extra buffs. So when his buffs drop/dispelled, he is ready to taunt again. This is incredible. Dk is squishy (even with dt zeta). This is the only flex spot. He is powerful, but is an offense team toon. He is not for defending. This is probably a sidegrade/downgrade to veers. To land. His taunt has negative synergy with shore since they both bring crit immunity and he needs that for a taunt. 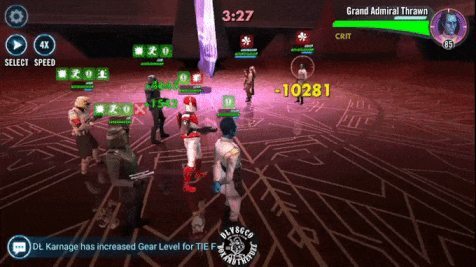 Gk can't heal but thrawn brings fracture and protection heal and a much more damaging basic and 100% counter when he fracs someone. 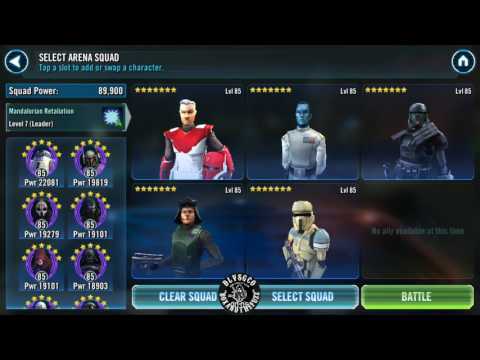 Gk is not an upgrade over thrawn. Have you played with zfost? He counters and his counters can call in an assist. Gar will trigger in both of these. So there can be 4 attacks from 1 counter. Fost counter, his assist call and then 2 from gar. Fost has a 2 turn taunt and 3 turn cd. His taunt give teamwide tm gain. His basic adds a slow. Which in case you didn't know, has positive synergy. So yes. Zfost is amazing. I'd suggest using him and yea, he isn't meta! Veers is the flex spot. That is it. I am curious if he consider fost. @Nebulous I did try it. I have several videos against different comps. @BoxandthefuzzForever awesome. I'll check out the video later tonight. You've inspired me to play with gar. Mine is currently 6* g9. I'm working on jyn. @BoxandthefuzzForever what team do you leave in overnight? I like how fost performed in that video. Thank you for the post. Not as strong as a few other empire leads... Thrawn takes the cake right now I think... Vader, Tarkin, Emp, and even DK ate pretty solid when set up right. Its a fun team and it has its moments... but unfortunately it struggles vs certain setups (Zarriss especially) and lacks the ability to beat "everything". I've recently switched to something very similar to this - I've been running Veers for weeks now, since Thrawn hit - but I switched to a Thrawn lead + DK +DT + Storm and Shore. I do not have DT zeta'd even, and I find this setup incredibly impressive on offense at least. Defense first night I held at 10 when lately I've been waking up at 20+ with Thrawn lead, Veers, DN, DT, and Shore. Dropping DN was very refreshing - whipping Rex / R2 / DN / GK / Chaze, etc without using any of those toons - and doing so decisively - feels very good. Shore + Storm together are impressive. I have no issues with DK surviving. Good to know that you don't use DN anymore. I was hesitating to build him and remove StormT but I also find this duo complementary. I've modded Stormtrooper with CC/CD and a speed arrow and ShT as the real tank with full protection. StormT gives another buff to ShT then if he's dispelled, he can taunt again at his next turn. 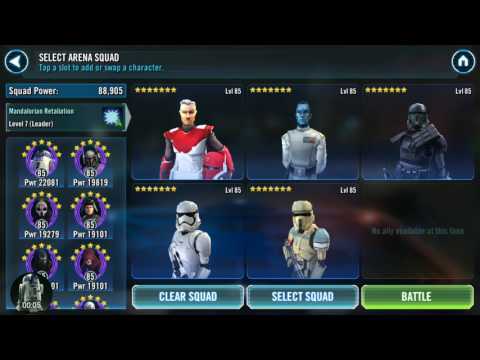 zVeers lead with Thrawn and DT for the rest and it's really fun. @BoxxandthefuzzForever how much damage are you doing with your AoE? Without crit and your current mode, you can hit up to 19k.